You can attach files from your computer, OneDrive, or other storage accounts to email messages and calendar events and share them with others. You can also embed pictures in your email messages and calendar events. The instructions are slightly different depending on whether you're using the Outlook on the web beta. Choose which version of Outlook on the web you're using to see the steps that apply to you. When you attach a file from your computer, you're attaching a copy of the file. Each recipient will get their own copy of the file. Note: The attachment size limit for local files is 34 MB. At the bottom of a message or calendar event, select > Browse this computer. Choose the local file you want to attach, and select Open. You can also share a file from OneDrive. This way, your recipients can collaborate on it in real time. Note: The attachment size limit for OneDrive files is 2GB. At the bottom of a message or calendar event, select > Browse cloud locations. Choose the file or folder you want to share and select Next. Double-click folders to open them. Select Share as a OneDrive link. Choose if people can edit the file or only view it. Select > Change permissions. You can also share files from other storage accounts. Anyone you share the file with can see the latest changes. In a message or calendar event, select > Browse cloud locations. Select the storage account from which you want to share the file. You can add storage accounts by selecting Add an account. Choose the file or folder you want to attach and select Next. Double-click folders to open them. Select Share as a link. 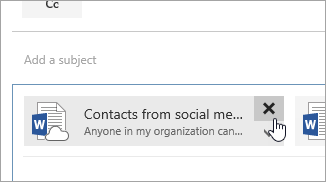 You can attach a message to another message in Outlook on the web. Create a new message or click to reply to or forward an existing message. Arrange the windows so you can see both the message list and your new message. Select and drag the message you want to attach from the message list into your message. You can't attach a copy of a folder in Outlook on the web. However, you can share a folder in OneDrive. Select the OneDrive icon in the taskbar, and select View online. This will open OneDrive in a web browser. On your computer, open File Explorer and go to the folder you want to attach. Drag the folder into OneDrive in the web browser. Go to Outlook on the web and create a new message or open a message from the message list. Select > Browse cloud locations, choose the folder in OneDrive you want to attach, and select Next. Select > Change permissions > Recipients can view. Select the message that contains the attachment you want to download. Next to the attachment, select . Open the message containing the attachment you want to print. Select the attachment, and then select Download. Caution: Don't open an attachment sent in an email message unless you trust the content and the person who sent it to you. Attachments are a common method for spreading computer viruses. In the email message, select Preview from the drop-down menu next to the attachment to view the contents of the attachment without opening it. Open the attachment using its corresponding app or program, and then print. For example, open a .docx file in Word and then print. In the email message you're writing, select at the top right corner of the attached file to delete it. 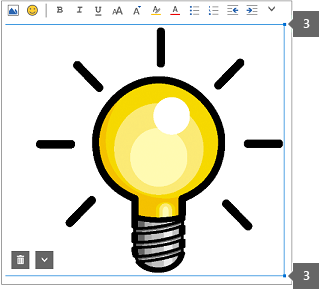 You can insert photos, gifs, or clipart from your computer or OneDrive as inline pictures in email messages, calendar events, or your email signature. Inline pictures are displayed in the body of the message or calendar event. Open the message or calendar event. Select the picture icon to insert a picture from your computer or OneDrive. Choose the picture you want to insert and select Open. Drag the corner handles to resize the image. Note: Resizing an image doesn't reduce its file size. To learn how to reduce the file size of a picture, see Reduce the file size of a picture. Right-click the image to see formatting options. In an email message or calendar event, select Attach at the top of the page. Select Computer, choose the file you want to attach, and select Open. Tip: Double-click folders to open them. When you attach a file from OneDrive, your recipients can collaborate on it in real time. 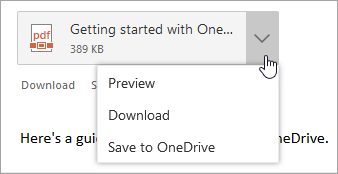 You can also upload a file on your computer to OneDrive and share it as a OneDrive file. Select OneDrive - personal or OneDrive - <your business name>. Choose the file you want to attach and select Next. To change if people can edit the file or only view it, select > Change permissions and then choose what people can do with the shared file. Open a new email message, or click to reply to or forward an existing message. Open the message in a new window by selecting at the top right corner. Note: If you don't see , first try expanding the message by selecting at the top right corner. 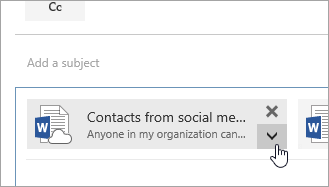 Arrange the windows so you can see both the message list and your new email message. Select and drag the message you want to attach from the message list to your new message. Select the attachment, and from the drop-down menu, select Download. After the download is complete, you can open the item and then print it. Select at the top right corner of the attached file. Select the picture icon to insert a picture from your computer. Choose the picture you want to insert and select Open . Drag the corner handles to make the image bigger or smaller. If you reply to a message that has an attachment, the attachment won’t be included in the reply. Don't open an attachment sent in an email message unless you trust the content and the person who sent it to you. Attachments are a common method for spreading computer viruses. Use the Reading pane to preview the message ( > Display settings > Reading pane) before opening it. Long file names of attachments might be shortened in Outlook on the web. This won’t affect the contents of the file. You only attach files to calendar events that you or a delegate created.